At last year’s Velocity Conference, many folks shared evidence of the impact of page speed on Web site usage. Since then, others have provided even more evidence. Like Every Millisecond Counts and Making Facebook 2x Faster, from the engineers at Facebook. And Proof that speeding up websites improves online business, from the guys at Strangeloop Networks and Watching Websites. More recently, the folks at Mozilla shared interesting results on the impact of page load speed and conversion rates in a series of posts (part I and part II). First and foremost, we believe that speed is more than a feature. Speed is the most important feature. If your application is slow, people wont use it. … If something is slow, theyre just gone. … We have every single one of our portfolio company services on Pingdom, and we take a look at that every week. When we see some of our portfolio companys applications getting bogged down, we also note that they dont grow as quickly. There is real empirical evidence that substantiates the fact that speed is more than a feature. Its a requirement. But the most common question I hear from folks trying to improve page speed is, “where do I start?”. I discussed this in some detail in a previous post. Recently I ran across more information relevant to this discussion. Philip Tellis, a member of the Yahoo! 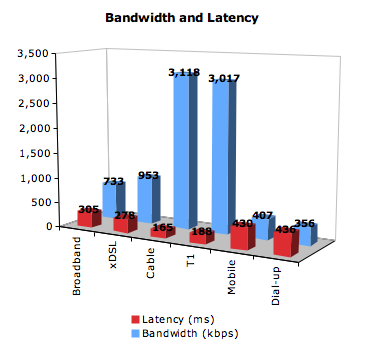 Exceptional Performance team, posted details of an analysis of bandwidth and latency experienced by visitors to YUIBlog.com. Discussed previously, as available bandwidth increases, the constraining factor on page speed becomes latency. Philip’s results show some surprisingly high latency numbers, especially for Mobile devices. While some things can be done to help reduce latency, such as moving content physically closer to users via CDNs, the most effective way to mitigate it, and improve page speed, is to reduce the number of object requests on the page. This can be accomplished in a variety of ways (e.g. image sprites, combining JS / CSS, progressive enhancement to load content gradually or on demand, etc.). That’s not to say that reducing the cost (e.g. compressing text, appropriately sizing and compressing images, etc.) is irrelevant – it’s impactful and often simple to accomplish. But in many cases, the biggest improvements in page speed will come from reducing the number of objects. Both of which reduce the number of object requests.